Ramses Hilton celebrated this year’s Mother’s Day by going to elderly homes. 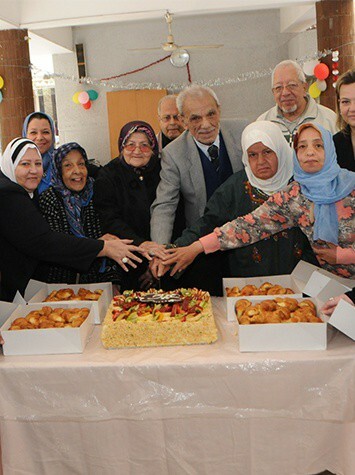 The Blue Energy committee members organized a trip to elderly homes, where they spent the entire day entertaining the ladies, taking pictures, and having cake made especially for this occasion. This isn’t all; another event was held. The hotel’s Executive Chef, Chef Dimitrious joined by Indian Chef Deepu Joseph, held a cooking class especially designed for Mother’s Day. The culinary demonstration session took place at Windows on the World Roof-top Restaurant. It was followed by a succulent lunch at Maharaja Indian Restaurant. The Chefs shared their culinary passions with a select group of ladies. By the end of the day, they had all learned how to cook a full Indian meal.